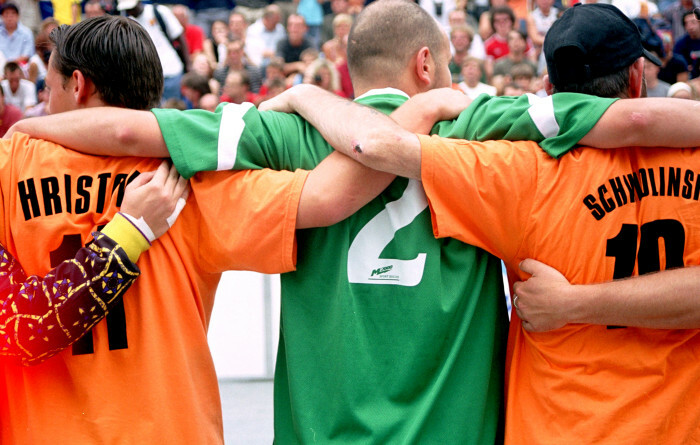 The Homeless World Cup exists to beat homelessness with football. A world-class annual, international football tournament unites and inspires grass roots football programmes for homeless people in 70 nations. 77% of players change their lives coming off drugs and alcohol, getting homes, jobs, reuniting with families, becoming football coaches and setting up their own enterprises. To date over 250,000 people have benefited from this transformation worldwide. When I joined the Homeless World Cup in 2005 as Global Communications Director 20 national partners made football available to approximately 5,000 people. All national partners were provided with simple, focused messaging and communication materials to become communication hubs pulsing and sharing the same vision, mission and message around the world. We consistently focused the radical unheard of positive impact and 77% rate of transformation. The players as heroes openly shared their stories of greatness, courage and determination inspiring everyone they touched, breaking down entrenched stereotypes. Within 5 years this consistent message created an energy attracting resources and support for the Homeless World Cup to grow to 70 national partners to reach and enable more than 250,000 players to change their lives. Working with brand strategist, Marc Ortmans and graphic design agency, Why Not Associates we created the inspired iconic goal mark and visual identity for the Homeless World Cup. Brand guidelines were rolled out to over one hundred different parties across all nations and cultures, including 70 national partners, the local organising committee for the annual event, international sponsors and global media. Respected by Nike, UEFA, United Nations this strong brand identity generated recognition, pride and confidence in players and partners around the world. Around 400 high profile international media attended the Homeless World Cup to report on the football and the triumph of the players each year. This included ongoing media partnerships established with Eurosport, CNN and ESPN. Well-known personalities were recruited as spokespeople including Desmond Tutu, Eric Cantona, Rio Ferdinand, Didier Drogba, Colin Farrell, Marsell Desailly, Lewis Hamilton and Marco Materazzi sharing the Homeless World Cup story on television stations around the world including The David Letterman Show, Sky Sports, BBC, SBS, TF1. In 2010 we won the opportunity to work with Promax UK, Beautiful TV and Nike to create 60, 20 and 10 second promotional spots for the Rio 2010 and Paris 2011 Homeless World Cup. Carlinhos Brown and Eric Cantona provided music and voiceovers, CNN donated over $2 million of advertising spots internationally, Nike distributed across social media channels and in store and it went out on TV in Brazil and France and across all social media. With a passion for documentary film I facilitated over 30 documentaries produced for film festivals and television series including working with DeMensen in Belgium that initiated a national homeless football programme in Belgium for an 8 part national television series. I was executive producer for international documentary Kicking It, directed by Susan Koch and narrated by Colin Farrell which premiered at Sundance Film Festival, sold to ESPN and secured core funding for development of the USA national homeless soccer programme. It was at Sundance that I secured a drama motion picture with Colin Farrell, Blueprint Pictures and Film Four and remain as consultant whilst in development. And with our international partner, Nike we produced an annual short film of the Homeless World Cup tournament that was distributed online and international speaking platforms. In 2011 Cone Marketing researched online share of voice in sport for social development and Homeless World Cup came out as the clear established leader with a 68% share with Women Win the next best at 10%. “Kat is a powerful, imaginative and intuitive leader with a great capacity to see a vision and make it happen. She is stimulating to work with and greatly respected by our players, partners and global media. What sets Kat apart is her heart. She works with passion and exudes creative energy and enthusiasm that is both inspiring and contagious.